Baku Global Forum today is one of the most important international platforms to address important issues on global agenda, urgent issues, Azerbaijani President Ilham Aliyev said. 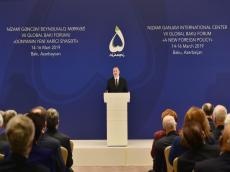 He made the remarks March 14 at the opening ceremony of the 7th Global Baku Forum. “So, in this room today we have an outstanding intellectual potential which actually is a reflection of the importance of the forum,” he said. “There are many international events, conferences on global agenda, but the quality is measured by list of participants and by experience of them and intellectual potential. Therefore, I think that Baku Global Forum has its unique place on the road map, and what will be discussed in the coming days I am sure will attract attention of those who make decisions about the future of international relations and future of the world,” the Azerbaijani president noted. “Talking about Azerbaijan’s foreign policy, I would say it has not changed much, we cannot talk about new Azerbaijani foreign policy, but of course, situation in the region, in the world, is changing and we are adjusting, our foreign policy initiatives to the changing world,” he said. “Talking about regional security of course, we must talk about the conflict between Armenia and Azerbaijan,” he added. “There have been and still we see the tense of the Armenian government to try to change the negotiation format,” the Azerbaijani president said. Using this opportunity of close cooperation between different countries Azerbaijan launched the Baku process, Ilham Aliyev noted.